A Florida Medicare supplement policy is also known as Florida Medigap insurance and these policies are provided by private health insurance carriers. They are designed to supplement and operate only with Original Medicare. Private insurance carriers solicit Medicare supplement plans. 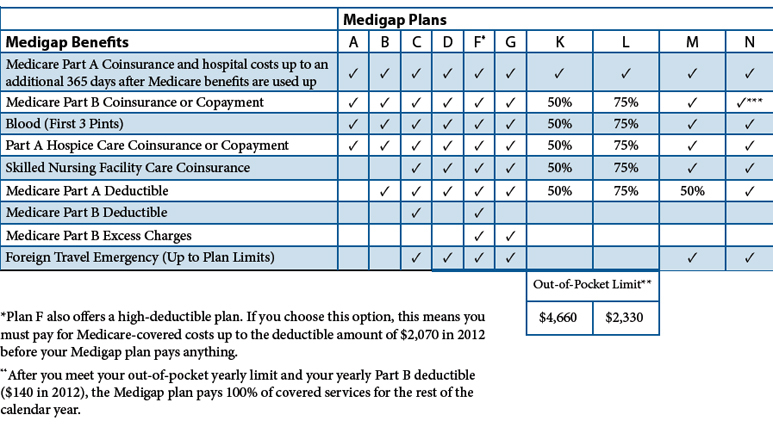 These plans help fill in the gaps in Original Medicare such as deductibles, coinsurance and co-payments. A Medicare supplement plan often covers certain medical services Medicare doesn't cover. A Medicare eligible beneficiary, with the purchase of a supplement, will generally have 100 percent of their Medicare-approved health care costs covered if the most comprehensive plan is selected. Florida Medicare supplement plans are identified by letters A-N. It's important to note, each carrier offers the exact same coverage because the plans are standardized by the government. This makes the premium the only consideration in selecting a carrier. Even if a carrier goes out of business, you have an opportunity to go with another carrier under guaranteed issue status and will be approved regardless of medical history. The graph below shows you what each lettered plan covers. These plans help with managing out-of-pocket costs. You get the freedom to choose any Doctor that accepts Medicare. There are no claim forms to be submitted. These policies also offer national coverage and foreign travel coverage too. All plans are guaranteed renewable. This means your policy renews automatically each year as long as you keep up-to-date with your premiums. RTC Insurance Advisors offers the most competitively priced carriers to choose from. Contact us today for a free quote and to get assistance in selecting the most appropriate Florida Medigap insurance policy for your needs. Don't forget to lower your homeowners insurance rate while you are visiting us.